Dead pets don’t make for great advertising. 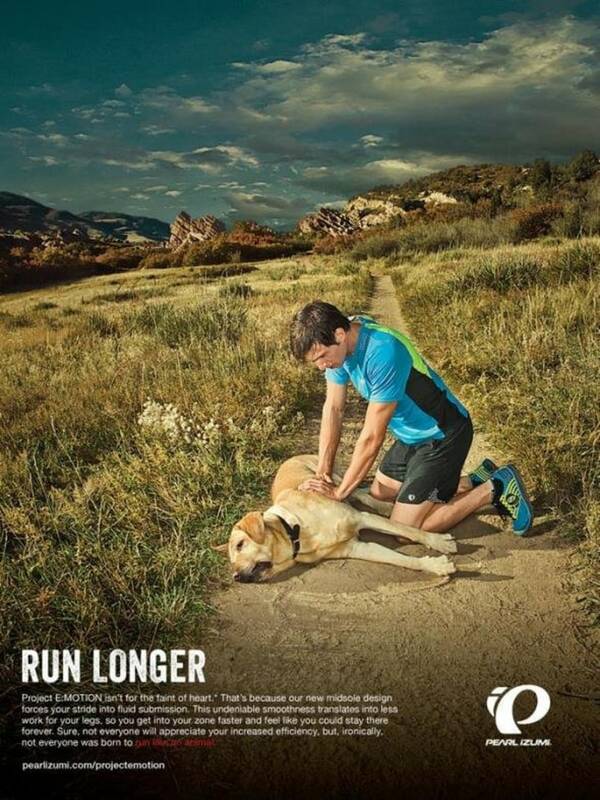 Running shoe maker Pearl Izumi discovered this the hard way after running an ad of a dog suffering a heart attack while on a run with its owner. “These types of images will inherently be upsetting to people,” said Mike Johansson, a lecturer in the communications department at the Rochester Institute of Technology and social media strategy consultant. “When animals are perceived to be feeling pain, we as human beings can’t help but feel bad,” Johansson said. The ad — part of a campaign that also included a video with a similar theme — didn’t fetch the response its creators hoped for. After it appeared in Canadian Running Magazine, outraged dog lovers blasted Pearl Izumi on social media sites for depicting what appeared to be an unconscious yellow lab lying on a trail with its owner, dressed in running gear, kneeling with his hands positioned over the dog’s chest as if to perform CPR. In the wake of the firestorm, the company pulled the ad and posted an apology on its Facebook page. Although the dog in the ad is fine, Johansson said it’s a bad idea to portray “any vulnerable population” in distress. “Corporations get so caught up in their messaging they forget to run it by some regular folks and get a gut reaction,” he said. And people can put their dogs at risk by running with them, said Curtis Cathcart, a veterinarian in Akron, Ohio, since dogs can’t sweat to stay cool and can overheat more easily. “People may feel fine, and their dog isn’t necessarily fine,” Cathcart said. “What goes along with that and why they don’t stop is they’re trying to keep up with you.” That loyalty can be dangerous if the owner is inattentive, he said. But Shaffer said Pearl Izumi doesn’t plan to act on suggestions by social media users who said the company should donate to dog shelters or rescue groups. “Most of us in the office have dogs, we run with our dogs and we were surprised by the reaction,” he said. Credit card confusion: How do I earn those rewards?